SpaceRock. Some bands are floating and ethereal, focusing more on the space than the rock. Others are more rock oriented incorporating elements of space into their music. Born to Go doesn't so much fall into the later category as they do divebomb into it propelled by a force beyond anything yet known in the nuclear age. Heavily metallic, often punkish, and at all times energetic, the band cranks out a brand of metal rock accompanied by swirling cosmic synths, and songs based in science fiction and technology themes. The band consists of Marc Power on bass and lead vocals, Mark McClemens on drums and percussion, Greg Florko on guitars, and Louis Boone on synths and audiogenerators. In the absence of a regular CD release, Born to Go have released this video document of their live show which is an excellent introduction to the band. This is music that is best discovered complete with the lights, smoke, alien background, and robots (we'll get to them). The video includes two performances, one from 10/12/98 at the Lion's Den in New York City, and another from 10/3/98 at the Orion SpaceRock Festival in Baltimore, MD (with additional synth guest Carl Howard). Also included is a video of the song "Navigator" from a New York City cable television show. The Lion's Den performance is first and opens with astral synths that leave the uninitiated off guard for the assault that's about to come. Soon we hear the clapping together of drum sticks and WHAM... the band launches into the rocking space frenzy of "Farthest Star", a great opening number that begins both of the video's shows. The next song, "Navigator", is one of my favorites with it's punked out pace, and Power's blazing "Let me be your navigator, let me be your guide!" lyrics. Power is an enthusiastic frontman with powerful vocals that shout, growl, and express whatever other form of aggression that a song calls for. For pure fun my favorite is "Robots On The Rise" which tells of the Robosapien slave race and it's rise to revolution. About a dozen little mechanical robots are unleased on the floor in front of the stage and scurry about with lighted eyes flashing as the band blasts through the fury of the song. The song that made my wife a Born to Go fan is "Kill -9". She's a Unix systems administrator so when Power announced that the song is made up of Unix commands she immediately put down her book and paid attention. "Kill -9" is apparently the most powerful kill command in Unix. Music for space cadets and tech heads! The Orion performance is next and I'm glad the Lion's Den show was first. The video camera is mobile and of a better quality, while the camera at the Orion show is static and somewhat distant. However, by the time I got to the Orion show I was familiar with, and rocking with, the band so I enjoyed the extended set of songs that this show offered. So if your taste in SpaceRock is along the lines of Motorhead, Monster Magnet, and heavier Hawkwind, then Born to Go gets my highest recommendation. I really regretted missing them at the Strange Daze Festival in August (1998) and now I see how much I really missed. AI: How long has Born to Go been in existence as a band? a. Guy Fawkes/Fireworks day in the U.K.
c. The day the current lineup was fixed. AI: How did you choose the name Born To Go? Why not Brainstorm, or Golden Void, etc.? MP: We are obviously very inspired by the work of British veteran SpaceRockers Hawkwind, though we are not, as you are probably aware, a cover band. we write all-original material with Sci-Fi or fantasy themes. Our name derives from a line that was printed on the cover of the original Space Ritual poster (designed by the late, incredible Barney Bubbles). "We were born to go, as far as we can fly, to turn electric dreams into reality"
As far as I know, the line is not even sung on the Space Ritual "Born to Go", it just sits there on the cover, a strange message to us all from Bob Calvert and Barney Bubbles. It succinctly puts across what I wanted to achieve and project in putting this band together. We will go as far as we can fly. Fly. Not walk or run, and as far as we can, testing our outer limits. Turning our electric dreams into reality, creating something awesome, something incredible with our lives, leaving a lasting trace and not wasting our three score years and ten. That's why we are BORN to GO, it's a way of life. AI: Your music is among SpaceRock's heaviest. Sometimes even punkish. Are you headbangers at heart? MP: Guilty. I used to follow Motorhead around the U.K. when they still had Larry Wallace from the Pink Fairies as their guitarist. Later I was in a number of Punk bands. Hawkwind, Bob Calvert, Nik Turner, Pink Floyd, Gong, Alien Planetscapes, Pressurehed, Krel, Farflung, Motorhead, Black Sabbath, Thin Lizzy, Led Zeppelin, Blue Oyster Cult, the Pink Fairies, The Damned, the Buzzcocks, Magazine, Luxuria, the Adverts, the Misfits. Currently I am listening to the Offspring - Americana. AI: Tell me about the SpaceRock Manifesto. How did that come about? MP: I became aware last year, just before the first Strange Daze festival, that SpaceRock had become an incipient scene in the U.S. and that there was an opportunity to help both define and refine it. People were forever saying to me: 'what kind of band is BORN to GO?' I would reply that 'We are a SpaceRock band', Which would create the inevitable: 'What's SpaceRock?' And I would explain about Hawkwind and early Pink Floyd, and if I had time I might mention Krautrock, in passing perhaps Sun Ra, and I would have to generally educate the person in the history of SpaceRock and even then they might have no clue as to what we (or any other SpaceRock band) would actually sound like. So I came up with a working definition of SpaceRock: "SpaceRock is music, which, by design, expands your AWARENESS through SPACE, MIND and TIME", which I then began to use as a shortcut explanation. Eventually this became Axiom I of the SpaceRock Manifesto. AI: This video is an interesting way to get the word out. Is this your first attempt to get Born to Go recordings out to people. Any cassette releases, etc? Any recording plans for a "regular" release? MP: We released a four track audio cassette called 'This is SpaceRock', which got good reviews, but couldn't really convey the intensity of our live performance. The video does that much better, though the sound quality is mediocre. We also gave away one hundred CD-R's of our performance at Strange Daze 1997, and somehow that got reviewed in fanzines too. And another CD-R compilation of rehearsal and new songs called 'Greatest Hits From Deepest Space'. We are currently soundproofing and building a recording studio in my basement and when that is completed we will be working on recording our song 'Millennium Crash' on CD for release as a single ASAP. 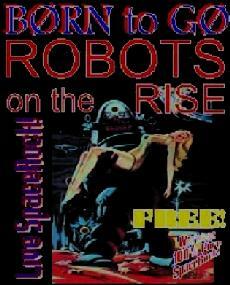 Then we will be recording our debut CD, which will probably be called "ROBOTS on the RISE", like the video. AI: What is the last bit after the Orion show? It looks like a local access cable show. MP: It's a Brooklyn-based cable show called the Neal Alpert Show, there was a video crew at a club we were playing at, videoing a band on before us. They were packing up their gear when we came on. When they saw and heard our show they unpacked and set up again to record us too. AI: Your song titles and lyrics are nearly all science and technology oriented. Y2K, Kill -9 and its Unix commands, etc. Are you a programmer? General tech head? MP: Errr. Yes, but I am not the only one, our guitarist, Greg, actually thought of the idea for "Kill -9", though I wrote most of the lyrics for it. AI: I love your Robosapiens! Watching these performances, they seem to have a significance beyond mere props. MP: They started out as just one Robot. The first time we let him loose the audience were chanting 'Robot! Robot! Robot!' when we turned him off, so we turned him back on and let him run loose among them. "Robots on the Rise" is a song about Robot rights, after all. The RoboSapiens represent the oppressed, whomsoever they are. Now we have twenty-five RoboSapiens and we are always on the lookout for more. AI: I met several people at Strange Daze '98 that didn't know any of the bands except Hawkwind. Do these festivals win a lot of new fans for Born to Go? MP: Yes they do, but it's easy for SpaceRock fans to find us. We get reviewed or featured in one of the SpaceRock fanzines and suddenly we have twenty-five requests for videos from Finland (a true story). Another bunch of fans in Scotland were asking me if they could copy and share the video since they were planning a BORN to GO video party where they were going to get together, watch the video and make copies. I said sure, no problem. Just remember that with everything free, there is still a price and the price of our free video is that, if you like it, you spread the word about BORN to GO. Share the video around, tell your friends about us, come to our gigs, whatever. People have been really good about that so far. We have had a great grassroots response, really great feedback from all over the world. We have been trying to spread our wings a bit and become better-known outside of the SpaceRock genre. We have been playing on heavy metal and stoner-rock bills, they generally have never heard anything quite like us before and they really get into it. 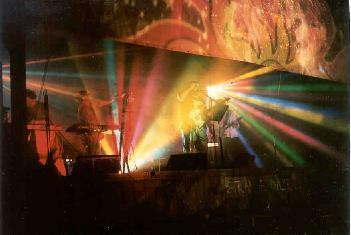 We played at Worldcon 1998 too, in Baltimore, it's the worlds largest Science Fiction convention. Our performance there wasn't promoted very well and there were a bunch of other events scheduled at the same time, but we still got more than 200 people out to see us. It could have been five times that with the right promotion and scheduling though. We would be happy to do it again if that side of things was handled just a little better. AI: With the perspective of having lived on both sides of the big pond, where do you think the space scene is most happening right now? MP: Andy Garibaldi has some interesting things going on in the U.K., with both Spacehead and Krel signed to his Dead Earnest Records. But I would have to vote for the U.S. SpaceRock is a really happening scene right now, particularly on the East Coast. Currently I am involved with a musical project code-named THE ENTROPY TANGO, which features musicians from a number of east-coast U.S. SpaceRock bands getting together and cooperating on a songwriting and recording project. SpaceRock is gathering momentum in the U.S. Monster Magnet has a hit album and two singles in the billboard charts, though they are covert SpaceRockers. It's a little like how the Ska scene was here about six years ago, before No Doubt and all the rest broke the ice and exploded onto the scene. Same thing with the Seattle grunge scene in 1989. SpaceRock will reach critical mass soon. All the SpaceRock festivals and SpaceRock bands and SpaceRock fanzines are the same leading indicators. AI: Do you get to play live much? MP: We love to play live, but we have to concentrate on recording and getting our music out there in a radio-ready format. AI: If Born to Go could do the soundtrack for any sci fi movie, which one would you choose? MP: Perhaps if they made a sequel to The Day The Earth Stood Still, or Bladerunner or Forbidden Planet or Crash? Does that count as SciFi? AI: We only spoke briefly at Strange Daze '98, but I do remember you letting loose with an enthusiastic "I LOVE SPACEROCK!" What is it about SpaceRock that so excites you? MP: Because it's so full of possibilities! That's why I love Science Fiction and SpaceRock is the soundtrack of Science Fiction. What's more is that SpaceRock is happening now and right here in the U.S. Yes, I Love SpaceRock! AI: Any final newsbits or info you'd like to pass on? MP: We just wrote a new song about Wilhelm Reich, discoverer of Orgone energy it's called 'Doctor Reich' and it's slightly tongue-in-cheek. Our next song will be about a secret World War II project known as Project X-Ray. It rivaled the Manhattan project and was fully expected to win the war if the atomic bomb Manhattan project failed to produce a suitable weapon. The BORN to GO mailing-list can be found [on the internet] at onelist.com. Subscribe and then send your messages to borntogo@onelist.com. I also run another list there called spacerockers@onelist.com which is for news, views, and SpaceRock discussion. You can visit Born to Go at their web site.